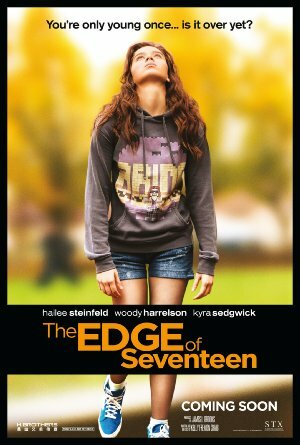 Writer/director Kelly Fremon Craig takes us on a journey through teen angst in the 21st Century in The Edge of Seventeen. “Nadine Byrd” (Hailee Steinfeld” has made it to her junior year in high school making only one friend along the way, “Krista” (Haley Lu Richardson). Like most teens, her relationship with her parents is a mixed bag, especially since her older brother “Darian” (Blake Jenner) is the prototype for the perfect child. Darian is a senior and a major success at the same high school Nadine attends. Nadin’ts mother “Mona” (Kyra Sedgwick) has ‘issues’ and those are exacerbated when Nadine’s father “Tom” passes away in 2011. Now it’s 2016 and Nadine’s life is about to get a lot more complicated. Nadine finds out that Krista has hooked up with Darian. Worse yet, it moves from the one-time stage to an ongoing relationship and that causes a major rift between them. With no one else to turn to, Nadine approaches one of her teachers, “Mr. Bruner” (Woody Harrelson). She also winds up taking to one of her fellow students, “Erwin” (Hayden Szeto) who is attracted to her, but she only has eyes for “Nick” (Alexander Calvert). The theme of the isolated outsider teen looking in at the good cliques has been done over and over, making the challenge for Ms Craig a difficult one. How to achieve separation and make a new mark in the genre. It is a challenge she overcame with a combination of a great company of actors and some stellar writing. Making Ms Craig’s work easier is a performance for Hailee Steinfeld that could be considered a second breakthrough role. Nominated for a Best Supporting Actress Oscar for her work in the remake of True Grit, she’s moved on from precocious 13 year old roles to those of young adult women. She turns 20 in December and could go on playing teen roles, but she’s proven ready to set her sights higher. One of the things that makes The Edge of Seventeen a standout is how it illustrates how technology has increased rather than eased the angst of being a teen, without hitting the audience over the head with it. It also uses the very talented Kyra Sedgwick very effectively as the often-absent mother who loves both her children deeply but seems able to communicate with only one of them. And Woody Harrelson’s work as the teacher who is the kind of teacher we all wanted to have in high school is his best work in the two decades since he soared in The People vs Larry Flynt. The “R” rating for language, sexual content and drinking, all by teens seems a bit much, compared to other films that were rated PG that were more inappropriate for a younger audience. Don’t let that stop you from seeing this winner of a movie.